When you're hard at work in your Mack® truck, you're covering all different kinds of ground. Whether you're hitting the highway or maneuvering rugged terrain, you need a smooth ride and suspension components that will do whatever it takes to protect what's inside your cab and trailer. Your shock absorbers have a demanding job, keeping vibration at bay by making sure your tires are in contact with the road. Shocks stroke an average of 1,750 times every mile they're driven, or 21 million times every 12,000 miles. That's a lot of wear and tear. And since you can't change a shock's oil, that fluid loses its viscosity and elasticity over time, impacting the shock's ability to absorb bumps in the road. Driving with worn shocks jeopardizes your truck's stability and steering, and can increase your stopping distance by more than 22 feet at 75 miles per hour. Cupped or uneven tire wear, a sign of excessive tire movement. Excess vibration and ride deterioration. Premature failure of other suspension components – such as tie rod ends and king pins – due to vibration. Sagging taper leaf springs / broken or torn air springs. Dents or cracks in the shock's housing. Leaking, a sign of worn seals. Slight "misting" is common during compression and extension, but a leaking shock will show clear signs of oil streaming from the upper seal down the shock body. When it comes time for service, count on the trained technicians at your nearest Mack dealership to make sure your shocks are road-ready. Be sure to get your shocks checked out by Mack-trained technicians every 12 months or 12,000 miles, and replace them at 100,000 mile intervals. 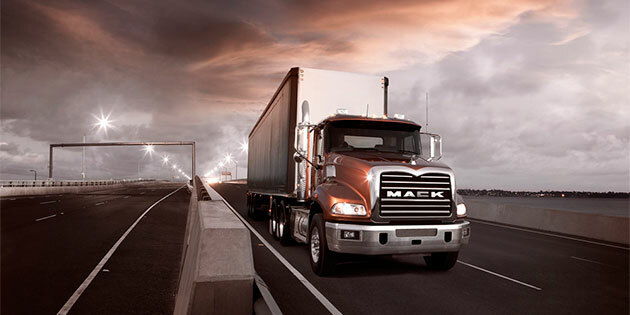 See the suspension experts at your nearest Mack Trucks dealership for more information about certified service and Mack's full line of conventional and gas-charged shocks, including value-priced Road Choice™ shocks. And shop online through SELECT Part Store™ for ease, convenience and regular discounts on high-demand parts and supplies.